In a near future, BIN PROPERTY will start two large-scale projects to provide offices for rent to domestic and foreign enterprises. This is the dedicated offices with wide parking system, fully equipped with security system and fire protection system which are modern and safe. 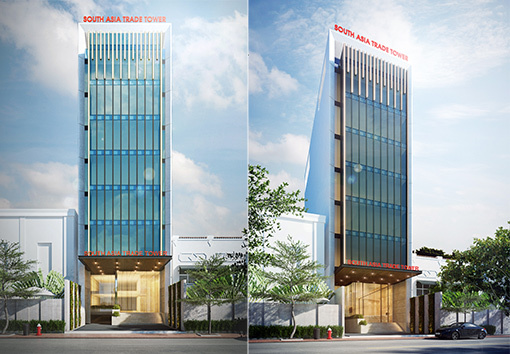 South Asia Trade Tower I project started in 2016 (it is going to be completed by June 2017) with an area of 2.000 square meters. This is class B+ office which is located at 513 Huynh Tan Phat, District 7, HCM City, Vietnam. South Asia Trade Tower II project is going to start in 2018 with expected floor area of 4000 - 5000 square meters. This is class A office dedicated for Vietnam and foreign enterprises, located in District 1, HCMC, Vietnam. In the future, BIN PROPERTY will open many office projects class A+ to meet the needs of the market, contribute to build a model of the modern-civilized office.